Sweater weather is the best time of the year. This sweater is a hybrid between a cardigan and a coat. The pockets add extra depth, a place to warm hands and a convenient spot to stash the essentials. This is a great addition to my wardrobe. It is light weight, but warmer than a sweater. Just received it a few days ago, and I was so impressed with the quality. I ordered an x-large and it fit perfectly. Ordered the blush color, lovely cross between salmon/coral color. Not a loud look at me, very feminine, made very well. 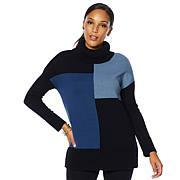 The sweater knit is soft and has some movement, so you won't feel bundled. I purchased an XL mainly for more room, and because it's an open coat. This is my first purchase of the Nina L. line, will be back. I purchased this cardigan in the pink. It's beautiful. The quality is great and fits true to size. Very pleased. I love this sweater Coatigan. It's very soft and comfortable and adds that special touch to my outfit every time I wear it. I initially purchased the Blush and I loved it so much I purchase a second one in navy. The blush is wonderful and I'm definitely planning to get one more but I can't make up my mind if I should get the black or grey, hmm maybe I'll get them both. The fit is true to size, I wear a large it's perfect. You won't be sorry. 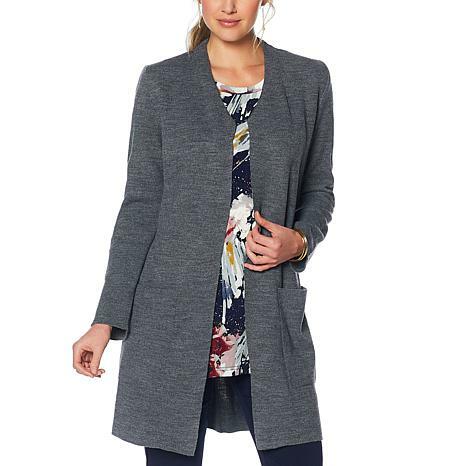 Create a wardrobe foundation that never goes out of style with this luxe French terry knit duster from Modern Soul. Neutral colors and a figure-flattering silhouette add a layer of luxury to your everyday look.